How do isotopes relate to average atomic mass? Every isotope (at least, the ones that occur naturally) contributes to the average atomic mass, which appears in the element's box on most periodic tables. But the average is what is called a weighted average. A weighted average mass is an average that takes into account how many times each mass occurs in a sample. For example, if 10 people in your class have a mass of 50 kg and 20 people have a mass of 60 kg, what will be the average mass? You might be tempted to add 50 and 60 and divide by 2 for an average of 55 kg. THAT WOULD BE INCORRECT. You must find the total mass (500 + 1200 = 1700) and divide it by the total number of people (30) so the average is 56.67. Notice the average is closer to the mass that had more people. If we add these two masses we arrive at 56.68. The answer is a little different because of the rounding. Both processes use the same steps (adding and multiplying) but in a different order. The second process is the one normally used in determining average atomic mass. It is possible to measure what percentage of an element's sample is made of each isotope. Then the weighted average is calculated and printed on a periodic table. Silver consists of 51.86 % Ag-107 (atomic mass 106.9 u) and 48.14 % Ag-109 (atomic mass 108.9 u). What is its average atomic mass? The average atomic masses on a periodic table are usually not a nice whole number. In elements with very high atomic numbers you will see whole number atomic masses. These are not average masses; they are the mass of the most stable isotope. Here is a video discussion of how to do this type of calculation. 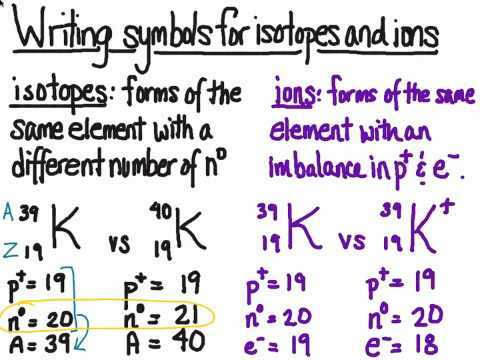 How do isotopes differ from ions? Isotopes differ in the number of neutrons; in ions the number of electrons is different from the number of protons. Isotopes are atoms that have the same number of protons but different numbers of neutrons. Thus, atoms of #""_6^12"C"# and of #""_6^13"C"# are isotopes of each other. They both contain 6 protons, but one contains 6 neutrons and the other contains 7 neutrons. Ions are atoms that have either gained or lost electrons. Every atom has the same number of electrons and protons. If an atom gains an electron, it gets a negative charge. If it loses an electron, it gets a positive charge. All ions have a charge. If a carbon atom gains an electron, it becomes a C⁻ ion. If it loses an electron, it becomes a C⁺ ion. An isotope is a variation of an element where the atom contains the same number of protons and electrons, but differs in the number of neutrons it contains in the nucleus. How would you find the atomic number, atomic mass, protons, neutrons and electrons for ions and isotopes? Is it similar? How are isotopes of elements formed? What radioactive isotopes are naturally occurring? How do isotopes of carbon differ from one another? Strontium consists of four isotopes with masses of 84 (abundance 0.50%), 86 (abundance of 9.9%), 87 (abundance of 7.0%), and 88 (abundance of 82.6%). What is the atomic mass of strontium? Why are the isotopes of an element chemically similar? Naturally occurring europium (Eu) consists of two isotopes with a mass of 151 and 153. 151/63 Eu has an abundance of 48.03% and 153/63 Eu has an abundance of 51.97%. What is the atomic mass of europium? Oxygen is composed of three isotopes 16/8 O (15.995 u), 17/8 O (16.999 u) and 18/8 O (17.999 u). One of these isotopes, 17/8 O, comprises of 0.037% of oxygen. What is the percentage abundance of the other two isotopes, using the average atomic mass of 15.9994 u. Copper is listed on the periodic table as having a relative atomic mass of 63.55. Reference books indicate two isotopes of copper, with relative masses of 62.93 and 64.93. What is the percent abundance of each isotope? Why are radioactive isotopes important? Why is it that only isotopes tend to be radioactive? Why are isotopes used in nuclear medicine? How do isotopes differ from each other? How do isotopes affect the atomic mass of an element? How can isotopes be used in medicine? How can isotopes be used in biological research? What is an example of a practice problem with isotopes? How are isotopic abundances determined experimentally? What is an example of an isotope abundance practice problem? Why carbon-12 is an isotope of carbon? If two atoms have the same atomic number but different mass numbers, what are they called? How many protons are in the nucleus of an atom that has an atomic number of 23 and a mass number of 51? How many neutrons does calcium have? What do isotopes of the same element have differing numbers of? What is the difference between an isotope and a radioisotope? How would you find the percent abundance of 2 isotopes of an element, given the atomic weight and mass number of each isotope? How would you calculate the percent relative abundance of Cu-63 with the mass 62.9296 g and Cu-65 with the mass 64.9278 g, when the average mass of Cu is 63.546? How is the mass number of an isotope expressed in the name of an atom? What are some examples of radioactive isotopes used in research? The atomic weight of a newly discovered element is 110.352 amu. It has two naturally occurring isotopes. One has a mass of 111.624 amu. The other has an isotopic mass of 109.75 amu. What is the percent abundance of the last isotope (109.75 amu)? Vanadium has two naturally occurring isotopes, 50-V with an atomic mass of 49.9472 amu and 51-V with an atomic mass of 50.9440. The atomic weight of vanadium is 50.9415. What is the percent abundance of the vanadium isotopes? What are two differences between the isotopes carbon-12 and carbon-14? What are two ways in which radioisotopes have been used to help humans? Calcium has three different isotopes. One has a mass of 35.00 amu; another has a mass of 41.00 amu; and another has a mass of 40.00 amu. Which isotope is the most abundant of the three? What is a radioactive isotope? What are the two stable isotopes that chlorine is commonly found in? What is the name of the carbon isotope that has 7 neutrons? What is the difference between an isotope and an element? What is relative abundance of an isotope? What is the importance of the isotope C14? What is the isotopic composition of an element? What is the most common isotope of chlorine? Gallium consists of 2 isotopes. One of those isotopes is 71-Ga with a mass of 70.92amu with an abundance of 39.892%. What is the mass number of the other isotope? What is the difference between an ion and an isotope? How would you know if an element is an isotope? What are three isotopes of carbon? What is the importance of carbon-14? How would you write the symbol for carbon -14 including atomic mass and number? How do atoms become isotopes? Two atoms have the same number of protons but different numbers of neutrons. What can you conclude about these two atoms? The atomic number of Uranium is 92 and its atomic mass is 238. How many neutrons does the most common isotope of Uranium have? Isotopes of an atom differ by what? What is the difference in stable and unstable isotopes? How do isotopes of a given element differ? How am they similar? How many neutrons are found in the unstable isotope phosphorus-36? Uranium, with an atomic mass number of 238 and an atomic number of 92, has how many protons? Gallium has two naturally occurring isotopes. The mass of gallium-69 is 68.9256 amu and it is 60.108% abundant. The mass of gallium-71 is 70.9247 amu and it is 39.892% abundant. What is the atomic mass of gallium? The element copper has naturally occurring isotopes with mass numbers of 63 and 65. The relative abundance and atomic masses are 69.2% for a mass of 62.93 amu and 30.8% for a mass of 64.93 amu. What is the average atomic mass of copper? One isotope of bromine has an atomic mass of 78.92 amu and a relative abundance of 50.69%. The other major isotope of has an atomic mass of 80.92 amu and a relative abundance of 49.31%? What is the average atomic mass of bromine? A sample of element X contains 100 atoms with a mass of 12.00 and 10 atoms with a mass of 14.00. What is the average atomic mass (in amu) of element X? The element chromium has four naturally occurring isotopes. What is the average atomic mass of chromium, using #""^50Cr=4.34%, ""^52Cr=83.79%, ""^53Cr=9.50%, ""^54Cr=2.37%#? Do all isotopes of an element have the same atomic number? How many neutrons are present in carbon-14? Which isotope is more likely to bond with oxygen, C-12 or C-14? How does the radioactive isotope C-14 differ from C-12? Silver has two naturally occurring isotopes with the following isotopic masses 106.90509 and 108.9047. The average atomic mass of silver is 107.8682 amu. What is the fractional abundance of the lighter of the two isotopes? The half-life of carbon-14 is 5715 years. How long will it be until only half of the carbon-14 in a sample remains? Is the half life of carbon 14 5730 years? How many protons and neutrons are in uranium-235? How do isotopes differ chemically? Argon has three naturally occurring isotopes: argon-36, argon-38, and argon-40. Based on argon's reported atomic mass, which isotope do you think is the most abundant in nature? What is the average atomic mass of chlorine if it has isotopes of masses 36.96590 and 34.96885, which are 24.47% and 75.53% abundant, respectively? Rubidium is a soft, silvery-white metal that has two common isotopes, #""^85 Rb# and #""^87 Rb#. If the abundance of #""^85 Rb# is 80.2% and the abundance of #""^87 Rb# is 19.8%, what is the average atomic mass of rubidium,? How can cobalt-60 and cobalt-59 be the same element but have different mass numbers? Copper has an atomic mass of 63.55 amu and two naturally occurring isotopes with masses 62.94 amu and 64.93 amu. Which mass spectrum is most likely to correspond to a natural occurring sample of copper? Why don't any of the isotopes of natural iron have the atomic mass of 55.85 amu, if the number listed in the periodic table is 55.85 amu? Naturally occurring uranium contains 0.72 percent of the isotope uranium-235. What is the mass of uranium-235 in 2,000 kg of naturally-occurring uranium? What are #"isotopes"#, and what is #"isopathy"#? The atomic mass of an element is the weighted average of what? What is the average atomic mass for neon? What is the average atomic mass of silicon? What unit is used for average atomic mass? Why is the average atomic mass for an element typically not a whole number? What defines the mass number of an isotope? #""^12C#, #""^13C#, and #""^14C# contain HOW many protons, and how many neutrons? What are the different forms called in an element that has forms with different numbers of neutrons? What is the molar mass of the isotope lead-208 (#208Pb#)? The atomic weight of a newly discovered e ement is 98.225 amu. It has two naturally occuring isotopes. One isotope has a mass of 96.780 amu. The second isotope has a percent abundance of 41.7%. What is the mass of the second isotope? The isotope sodium-20 has how many neutrons? What is the nuclear symbol for the isotope of gallium, #Ga#, that contains 40 neutrons per atom? Bromine consists of two isotopes with masses of 78.92 and 80.92 amu. What is the abundances of these two isotopes? Element X has two isotopes. X-15 has 7 protons and 8 neutrons. What is the atomic number and mass number of the second isotope, which has 10 neutrons in its nucleus? What are two differences between carbon-12 and carbon-14? What is another name for an isotope? Isotopes are considered stable when the strong overcomes the electrostatic repulsion between force positively charged what? Isotopes differ due to the number of what? What does #"X"# represent in the following symbol: #""_35^80"X"# ? Isotope differ in the number of which particle? Why do all isotopes of an element have the same chemical properties? Sulfur has an atomic number of 16. You have found an isotope that has a mass of 35. What is different about this isotope than a sulfur atom with a mass of 32? Carbon has an atomic number of 6. You have found an isotope that has a mass of 14. What is different about this isotope than a carbon atom with a mass of 12? Nitrogen has two isotopes, N-14 and N-15, with atomic masses of 14.00031 amu and 15.001 amu, respectively. What is the percent abundance of N-15? Why do you think isotopes of #N# are used in medicine as opposed to other elements with stable isotopes like boron, neon or sodium? Explain why atoms have different isotopes. In other words, how is it that helium can exist in three different forms? Isotopes are atoms of the same element with the same number of protons and a different number of what? What are neutrons and why are they important to isotopes? What are some ways in which carbon-12, carbon-13, and carbon-14 are alike? How many electrons are in an isotope of nitrogen with 8 neutrons? Another isotope of carbon has a mass of 14. How many protons, neutrons, and electrons are in this isotope? The halflife of a radioactive isotope is 20.0 minutes. How much of a 1.00 gram sample of this isotope remains after 1.00 hour? The half-life of chromium-51 is 28 days. If you start with 640 g, how much will be left after 56 days? How can you identify two ways in which carbon-12, carbon-13, and carbon-14 are alike? What do isotopes of a given element have? Why do all isotopes of an element have the same properties? How does the number of nuclear particles relate to the identity of the atom, and the identity of the isotope? What is the number of protons in an atom of carbon-12? Boron has two isotopes, boron-10 and boron-11. Boron-10 has five protons and five neutrons. How many protons and neutrons does boron-11 have? Explain. Both #"^18O# and #"^16O# are found in nature. However, #"^16O# Is the most common. Why? Which is the most abundant oxygen isotope? What occurs when electrons are added to the chlorine molecule, #Cl_2#? If an isotope of carbon has a atomic mass of 13, then how many protons does it have? The atomic mass of fictitious element X is 51.70 amu. If element X consists of two isotopes that have mass numbers of 50 and 52, what is the approximate % natural abundance of each isotope? How would we represent the formation of carbon dioxide with DIFFERENT carbon isotopes? Zirconium has an atomic number of 40. How many neutrons are there in an isotope of zirconium-92? What is the name of the isotope with 88 protons and 140 neutrons? How do you determine the average weighted isotopic mass of Carbon? When atoms of the same element have different mass numbers, what are they known as? What are 3 things isotopes of an element have in common? How do isotopes of an element differ? What will two neutral isotopes of the same element have different numbers of? Boron exists in two isotopes, boron-10 and boron-11. Based on the atomic mass, which isotope should be more abundant? Xenon has an atomic number of 54. A particular isotope of xenon has a mass number of 131. How many protons and how many neutrons does each atom of that isotope have? How do isotopes of an element differ? In what ways are they the same? A mole is the amount of a substance that contains as many particles as the number of atoms in 12 grams of what isotope? The isotope sodium-20 has how many protons? What is the difference between individual isotoples of the same element? How would you compare the abundance of the two naturally occurring isotopes of boron? The mass of a #"_10^20Ne# atom is is 19.99244 amu. How do you calculate its mass defect? What is the weighted average of the masses of all the naturally occurring isotopes of an element called? What are the units for isotopic abundance? What is the difference between the two isotopes of Li (Lithium)? There are 3 isotopes of carbon. Carbon-12, Carbon-13 and Carbon-14. The average atomic mass of carbon is 12.011. Which isotope of carbon is the most abundant? Why? How many neutrons are found in an isotope of F (Flourine)? Why is the atomic mass of iodine-131 not #"126.904 g/mol"#? What is the percentage occurrence of the isotopes #""^35Cl#, and #""^37Cl# is the average atomic mass of chlorine is #35.45*"amu"#? How can chlorine have an atomic mass of #35.45*"amu"#? #"Atom W has 9 protons and 9 neutrons, Atom X has 8 protons and 9"# #"neutrons. Atom Y has 9 protons, and 9 neutrons. Atom Z has 10 protons"# #"and 10 neutrons. "# What are the isotopes? How does #""^238U# undergo #alpha-"decay"# to give #""^234Th#? Is this a chemical reaction? How does uranium metal react with fluorine? All isotopes of a particular element have the same atomic number. How then do the isotopes of a particular element differ? How would you determine the number of protons an isotope has? Carbon has a third isotope, named carbon-13. How many protons and neutrons are found in each atom of carbon-13. Carbon-13 is a stable isotope, like carbon-12. How useful would carbon-13 be for radiometric dating? How do different isotopes of the same element compare? How do different isotopes of the same element differ? Gravimetric analysis of the chloride content of an asteroid gave #13.85%# #""^35Cl# #"(isotopic mass = 34.97 amu)"#, and #86.14%# #""^37Cl# #"(isotopic mass = 36.97 amu)"#. What is the isotopic mass of chlorine in the asteroid? Is it possible for two different substances to contain the same number of protons but different atomic numbers? How do you calculate the atomic mass of bromine? How is decay rate related to the half-life of a radioisotope? What do we call nuclei of the same element that have different masses? How many neutrons and protons in the isotopes #""^(25)Al#, #""^(95)Tc#, and #""^(120)Sn#? The atomic mass of silver found in nature is Ar (Ag) = 107,983. This silver is made of 107Ag and 109Ag Isotopes. Calculate the proportion of mass of 107Ag isotope which is in natural silver atoms? What is the average atomic mass of titanium if we have an isotopic distribution of #78.5%# of #""^46Ti#, #45.95263*"amu"#, #12.3%# of #""^48Ti#, #47.94795*"amu"#, and #""^50Ti#, #49.94479*"amu"#? Given that P-31 is the only natural isotope of phosphorus, what is the mass of one P atom and the mass of Avogadro's number of P atoms? Will two isotopes react differently?